At Tone Vale Chiropractic Clinic we primarily use a style of adjusting known as ‘Diversified’ This involves the chiropractor assessing the motion of the spinal joints and occasionally a pelvic alignment check. Once the fixated segments have been identified, a manual thrust is applied to these joints. This is done in a very controlled manner and is the result of 5 years studying at college and then experience in practice. Occasionally the adjustment results in a pop, this is gas bubbles being released from fluids around the joints. It is an interesting sound enjoyed by the few and hated by the many! The activator adjusting instrument delivers a low force, fast thrust to a very specific area. Because it is so quick the muscles surrounding the joints are less likely to resist and spasm. Due to its low force it is especially beneficial for young children, the elderly or those just don’t like the idea of being adjusted. Acupuncture needles are inserted into the soft tissues ( muscles, tendons, ligaments) thus causing a minor lesion which activates the bodies healing process and aids pain relief. Electroacupuncture is a technique that combines the use of acupuncture and electrical stimulation to aid pain relief. 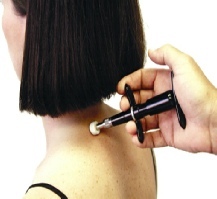 Adjustments are performed using drop mechanisms on the bench which allows for a high degree of control with minimal force applied to the patient. If you have seen a chiropractor in the past please discuss with the chiropractor the method of treatment that you consider suits you the best.